Did you know that the breathlessly lovely Lake Ringsjö is only 40 minutes by car from Malmö? Or that our cabins are built with a handsome view over the NW section of that lake? 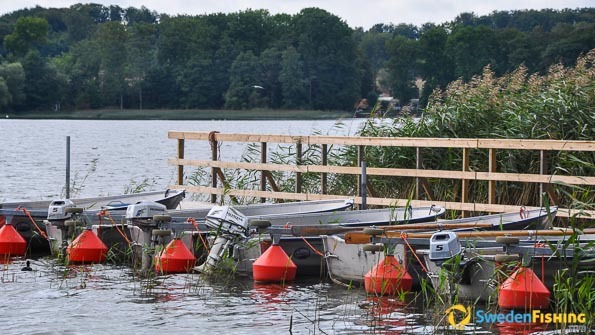 Perhaps you had heard that the boats are in the water by the dock waiting for you to push off and try your luck with pikeperch, pike, perch, eel and more? And that out fishing- and delicatessen shop is only a few minutes away? Join us for an unforgettable fishing experience! At Björks Ringsjön we speak Swedish and English. We’re open all year, but fishing for pike is best in the spring and autumn. Perch and pikeperch season is usually good, even when the water is warm from June through September. And ice-fishing is naturally best in the winter. Canoes, fish- and delicatessen shop, golf course (6 km), Skåne Animal Park (15 km), restaurants with plain food, pizza and Thai dishes (5 km) and Bosjökloster Manor (7 km). Lake Ringsjön is one of the largest lakes in the Skåne region, and a great place for a fishing holiday. 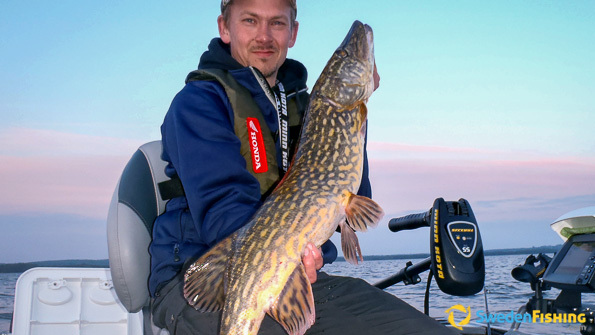 A few pike weighing in at 15 kg have been landed in Lake Ringsjö. Perch at around 1 kg aren’t unusual and the largest pikeperch weighed 12.06 kg! We have 4 meter Linder aluminium boats for rent, fitted with 5 hp, 4-stroke Honda motors. Fishing licence and charts. Guide can be booked for either a whole day or by the hour. For spin-fishing pike and pikeperch we recommend rods for casting weights up to 30 g. Vertickal jigging is excellent for pikeperch. For coarse fishing after perch we recommend worm bait. For wintertime fishing we recommend smaller ice-fishing rods and bait with balance pilk, vertical pilk or myrmyschka. However, ice-fishing for pike requires a rod with braked reel and bait with larger balance pilk or roach. We recommend Catch & Release for all fish you don’t intend to eat during your stay here. Motor trolling is not allowed, nor is fishing for pikeperch during May. 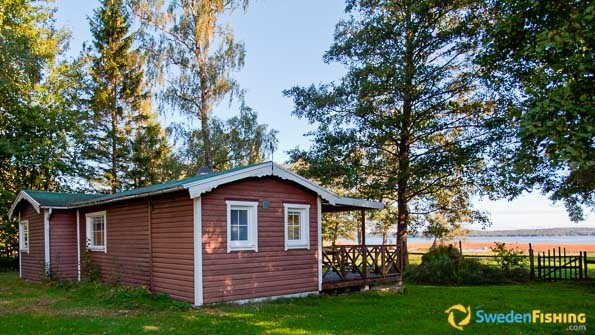 At Björks Ringsjön fishing you can choose between two modern, fully equipped overnight opportunities: The cabin has beds in two rooms for four adults or a family. There is a kitchen with all that is needed for self-catering, WC/shower and a fireplace. There are several windows with a view over the lake only 50 m away. The small Skåne-style, fully modern house is also built close to the shore and offers beds for six in three rooms, a fireplace and a sauna. Ringsjö fishing is located in central Skåne some 50 km from Malmö, 35 km from Hässleholm and some 70 km from Helsingborg. The car trip from the Kastrup Airport (Copenhagen) takes a bit over one hour.